Held in Hampden, this is often a wild and woolly ride! The stream seemed to be at a nice level this year. Last year, it was a bit too much, and many people portaged the trickier areas. But not so this year - people seemed to take glee in "tackling" the tricky areas and it looked like a good time was had by all. 65 registrations this year at the Sou, according to this Bangor Daily News article. Why this particular race isn't 10x more popular than it is, I'll never know! I really enjoy watching this particular race, so I'll have to get out the boat and take a shot at it next time around. The Marsh is one of those "dark horse" whitewater river races - it seems to slip under the radar for whatever reason. I don't know if this is because it falls on a Sunday (although there's a generous 1:30pm start time) or of it's because the race falls on the heels of the Souadabscook in Hampden. Back-to-back races aren't for everybody, and some people have to choose one race over another when they schedule their weekends. 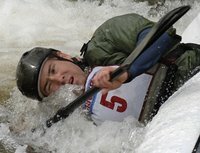 All I can say is that if any of you whitewater enthusiasts out there haven't heard much about this race before, take a closer look next time. 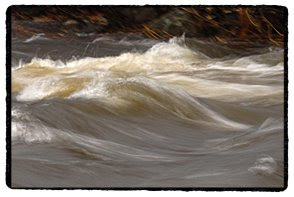 The whitewater "season" in Maine is short enough as it is; don't let these well-directed races fall by the wayside. This race is too good for that. 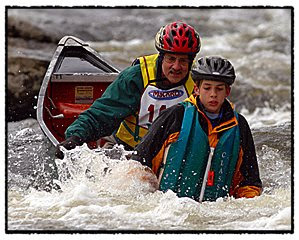 Kudos to the Penobscot Paddle & Chowder Society for safety work on this race - these folks really have their act together! I'm going to become a member of PP&CS. 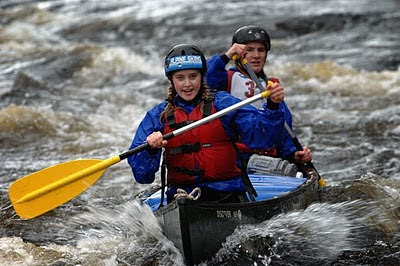 PS - I've posted my pics of both the Souadabscook Stream Canoe race here, and the Marsh Stream Canoe race here. Hope you enjoy them! I walked along portions of the stream today and will post photos and comments tomorrow. I simply ran out of time this evening! But in a nutshell, I would say that the stream is on the low side of medium, and I would characterize the flow as "mellow". The water levels are certainly good enough for a fun race and at the same time the conditions are mild enough to appeal to first time paddlers looking to take part this Saturday. An easygoing stream this year in many respects, and we can expect it to drop even further before race day. More on this tomorrow. If you have scouted the stream (especially the rapids) please write in the comments area about your impressions and observations. People from out of town - in fact, out of the country - will be grateful. PS - the shot above was taken at the Marsh Stream Canoe Race near Frankfort/Winterport. Nice race on an Easter Sunday. 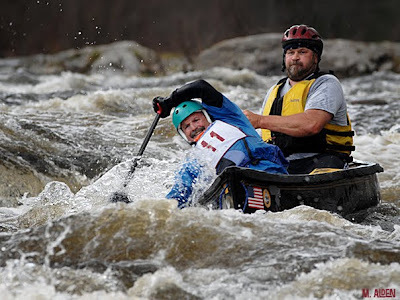 It was the second leg of the "Maine Whitewater Weekend", with the first leg being the Souadabscook Stream Canoe Race on Saturday. Keep it in mind for next year if you weren't there! 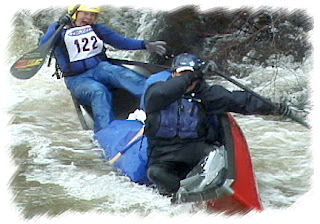 I've posted an 8-minute "highlight reel" video of the 2007 Souadabscook Stream Canoe Race on BlipTV. Also, here is an article about the Sou race from the Bangor Daily News.